Our locally native blue elderberry makes a good very large shrub or small garden tree. 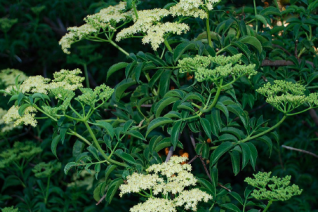 It has beautiful pinnate foliage, large fragrant umbels of white flowers followed by large clumps of edible blue fruit. Incredibly fast growing in youth it responds in a robust way to extra water in summer. Adaptable to nearly any soil type. And very drought tolerant as it matures. Fall color is often yellow but also lacking. Birds feast on the berries through winter. Otherwise they hang ornamentally on the bare twigs- also very showy. To 14′-18′ tall and naturally forming a vase shape. Oregon native plant.